So, fellow gardeners, when you're feeling outnumbered by the beasties in your garden, you are. 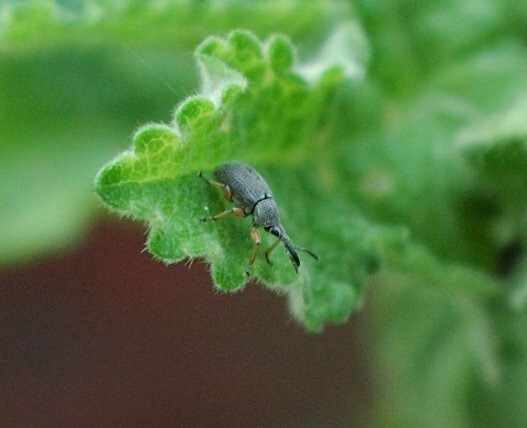 More beetle news from Xris of Flatbush Gardener who reports that the state of New York has decided to change the state insect to one that actually lives in the state of New York. Bev at Burning Silo steals the show with The surprise behind an Io Moth's forewings, from the water into the air, fireflies in action, eggs under a leaf and the hatchlings, and a strange chimera. She's got the best "bugs", and the most magnificent macrophotography of them. A slightly anticlimactic series of photos from Wayne at Niches. Owlet Butterflies from Carel's Rigor Vitae. Bobtail squid, pop-culture squids and a giant octopus from PZ Myer's Pharyngula. Drosophila melanogaster body clock gene and daily rhythms in Cnidaria from Coturnix. Image of carnivorous shrimp captured by a submersible and Washington State deep-water corals from Peter Etnoyer's Deep Sea News. And there's several blogs in COTS #10 new to me which are going on my rolls. It's sort of a good news (little), bad news (more), report. The "three states that have infestations" are New York, New Jersey, and Illinois. However, ALB has been detected near ports of entry throughout the United States, including Florida, Texas, California and Washington states. Invasive Forest Pests: Recent Infestations and Continued Vulnerabilities at Ports of Entry Place U.S. Forests at Risk, GAO-06-871T, June 21, 2006. All quotes above are from the Abstract. Asian Longhorned Beetle at the University of Vermont is comprehensive and accessible. Their identification page, with comparative photos of ALB and similar and easily confused species, is excellent. Artemisia vulgaris, Mugwort, in the sunny border at Garden #4 in Flatbush, Brooklyn, New York. The first photo shows the habit of growth. For scale, the stepping stones are 11" square. The plants in this photo are about two to two-and-a-half feet tall. The second photo shows an entire plant removed from this area. You can see the horizontal root below and to the right. The plant regenerates if any part of this root remains in the soil. After taking these photos I removed all the plants. Photos taken: June 4, 2006. This photo shows what you get less than 20 days later if you don't get all the roots out! 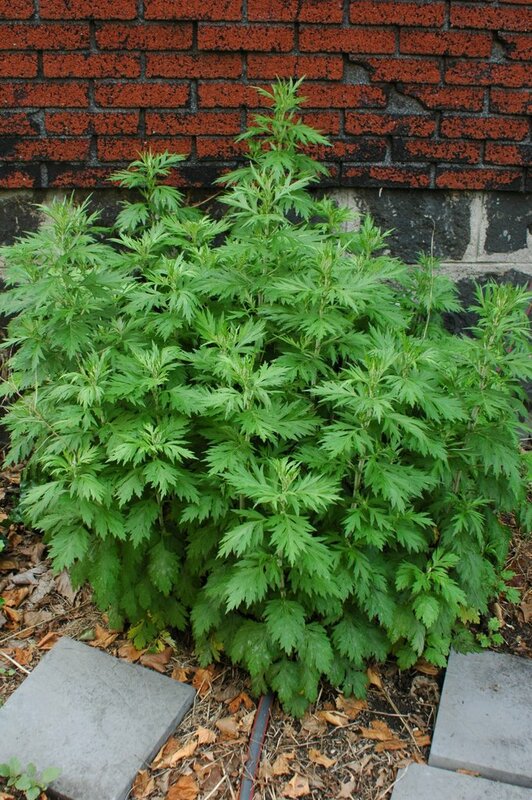 Artemisia Vulgaris, Common wormwood or Mugwort, is a perennial herbaceous (at least in Zone 7a) plant in the Asteraceae (Compositae), the Aster, Daisy or Sunflower family. 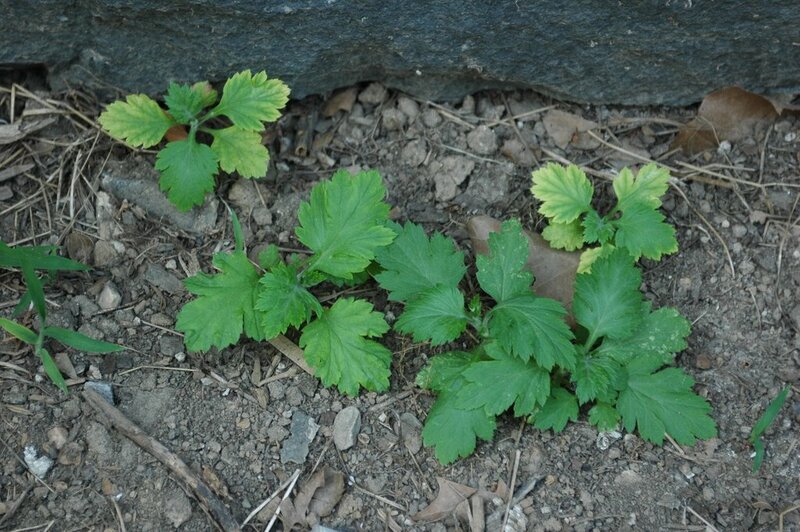 The emerging foliage, as seen in the third photo above, looks like Chrysanthemum. The maturing plants, as in the first two photos, remind me of ragweed. The pleasant (to me), pungent scent of the leaves alone identifies it as an Artemisia, a sage. The semi-woody stems and distinctive scent distinguish it from Chrysanthemum or ragweed. The flowers individually are insigificant. When in bloom, collectively the flowers don't offer much either, forming just a greyness around the tops of the plants, as if they had lint stuck between their leaves. I've seen some listings of more ornamental selections with more prominent flowers, and even one with variegated leaves. "Wort" is an old suffix for plants traditionally used for medicinal and healing purposes, for example: Lungwort. I don't know what "Mug" identifies that would need healing. It also has culinary uses as a seasoning. It's widely available commercially, sold as an herb. You're welcome to have mine for free, if there's any left after I'm done ripping it out. Artemisias also have toxic properties. Among other applications, A. vulgaris has been used as a natural abortifacient in early pregnancy. Another well-known member of the genus is A. absinthium, Absinthe. It has escaped cultivation and is reproducing in the wild. Several sources categorize it as invasive. Once established, it can be difficult to eliminate through mechanical means. It's common along roadsides in New York City. The photos from my garden above show the long, rambling root system, and how easily it regrows from any small part of the root left behind. I expect to be pulling this up for years from my garden, until I've exhausted it. Flatbush Gardener (Xris) reviews for us the book Eco-friendly Living in New York City and focuses on some of the book's gardening tips for city dwellers. I didn't (yet) review the book. It was reviewed in Science & the City from the New York Academy of Sciences. The gardening tips are all things which I do, or would like to do, in my garden with respect to two of the five general tips offered in the book review: reducing water use, and reduce, reuse, recycle. I didn't get them from the book. That aside, I'm proud to be listed. This is my first carnival. I'm no longer a "virgin." ... Previous small-scale human studies had suggested a link between pesticides and Parkinson's, but this new study is the first to establish a clear correlation in a large patient population. Sir Peter Smithers, who saw his work as a lawyer, politician, diplomat, scholar, photographer and spy as distractions from his passion for growing glorious gardens, died on June 8 in Vico Morcote, Switzerland. He was 92. Arguably, though, Sir Peter was to gardening what Bond was to martinis. The Royal Horticulture Society gave him one of its highest awards, the Gold Veitch Memorial Medal. His garden in Switzerland — with 10,000 plants, none a duplicate — won a prize for being the best in that country in 2001. The Financial Times said it was named one of the 500 greatest gardens since Roman times. Peter Henry Berry Otway Smithers was born in Yorkshire on Dec. 9, 1913. He grew up hanging around potting sheds, spending spare change on plants. His nanny was a fervent naturalist who fed him fried blackbird eggs and hedge trimmings. At 13, he persuaded the Royal Horticultural Society to let him attend the Chelsea Flower Show, the first child to do so, The Guardian said. At his public school, Harrow, he began an index of every plant and seed packet he acquired; it grew to 32,000 entries by his death. 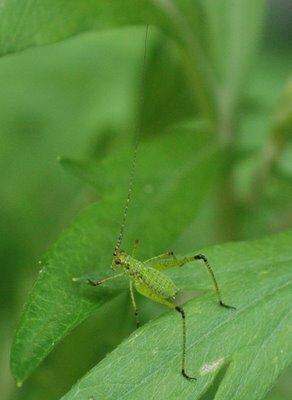 PURPOSE OR GENERAL IDEA OF BILL : Alters terminology of the state insect. JUSTIFICATION : To change the official state insect from the Nine-spotted lady beetle (Coccinella novemnotata) species of the lady bug, which is no longer found in New York State, to another species of Lady Bug, the Spotted lady bug (Coleomegilla maculata). PRIOR LEGISLATIVE HISTORY : New Bill. The state's official insect, a nine-spotted ladybug, would no longer fly in that role: it is extinct in New York State. So legislators took a break from bickering over health care spending and property taxes in the waning days of the session and found common ground on the issue of designating a new state insect, making it the pink spotted ladybug instead. ... "I know it's not earth-shattering," said the assemblywoman, Nancy Calhoun, who represents parts of Orange and Rockland Counties. Ms. Calhoun says she was just trying to right a wrong. Lawmakers first adopted the state's official bug in 1989, but the nine-spotted ladybug had already become extinct in the state. Ms. Calhoun was alerted to the error by a reporter a couple of years ago and she submitted a bill to rectify the matter. It's an interesting question. In fact, New York State has a state fossil, the Sea Scorpion, which is an extinct relative of the Horseshoe Crab, which is not. So intentionally selecting an extinct state symbol is not out of the question. The comparison is not accurate, however. Dinosaurs were extinct before we got onto the scene; C. novemnotata was once common. A better question is: How did New York State get to have a once-native-but-no-longer-resident state insect? In this article we focus on the vital ecological services provided by insects. We restrict our focus to services provided by “wild” insects; we do not include services from domesticated or mass-reared insect species. The four insect services for which we provide value estimates—dung burial, pest control, pollination, and wildlife nutrition—were chosen not because of their importance but because of the availability of data and an algorithm for their estimation. We base our estimations of the value of each service on projections of losses that would accrue if insects were not functioning at their current level.We estimate the annual value of these ecological services provided in the United States to be at least $57 billion, an amount that justifies greater investment in the conservation of these services. ... our findings lead us to espouse three qualitative guidelines. First, cost-free or relatively inexpensive measures are almost certainly justified to maintain and increase current service levels. Examples include volunteer construction of nest boxes for wild pollinators [butterfly houses?] and the inclusion of a diverse variety of native plant species in plantings for bank or soil stabilization and site restoration (Shepherd et al. 2003,Vaughan et al. 2004). Second, actions or investments that are estimated to have an economic return at or slightly below the break-even point, such as the use of less toxic pesticides, are probably justified because of their nontarget benefits. Third, actions that lead to substantial decreases in biodiversity should be avoided because of the high probability of a major disruption in essential services. Once the benefits of insect-provided services are realized, there may be some call for increased funding to conserve rare insects through the Endangered Species Act. Insects are certainly underrepresented and underfunded through this legislation, and increased funding could save many rare insect species from extinction. However, while increasing funds targeted for the conservation of endangered species would help those beneficial insect species that share habitat with listed species, it would not in itself be sufficient to ensure the continuation of the services provided by beneficial insects. The full text of the article is available in PDF format for free from the BioScience Web site. Unknown insect on Artemisia vulgaris, Mugwort, in the sunny border at Garden #4 in Flatbush, Brooklyn. It was small, the body no more than 1/2 inch long. I think it may be a juvenile form; it doesn't appear to have any wings at all. The antenna on this little guy are incredible. They look to be three times the length of the body, not including the legs. The hind legs themselves are about 1.5 times the length of the body. I have no idea what it is. I think it's in the Order Orthoptera, Family Tettigoniidae, which includes grasshoppers, katydids, and the like. It's hard to tell with this image, but the hind tarsi, the rear feet, look like they have only three segments instead of the four which is a key for this family of insects. 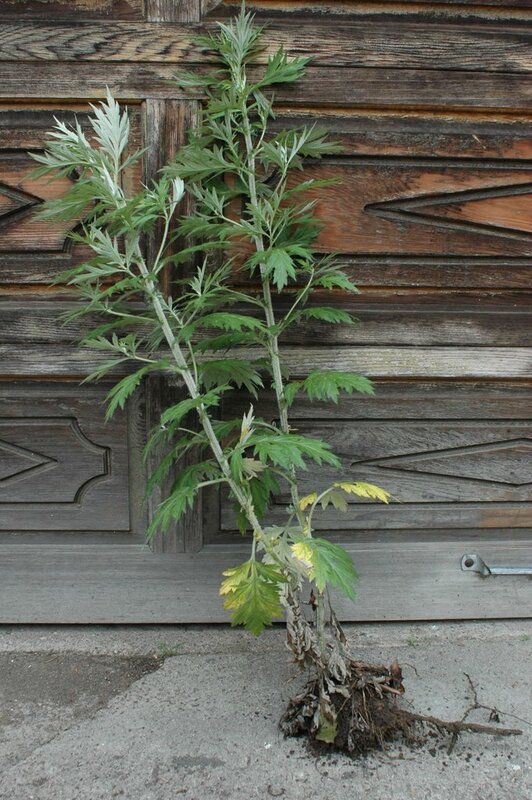 Artemisia vulgaris, Mugwort, is an invasive plant. I'll have a profile of it on another day. After I took this and some other pictures, I removed it from the border. It's been almost three weeks, and it's coming back up now, so Ill have to go at it again. Apion (Rhopalapion) longirostre, Hollyhock weevil, on, of all things, my hollyhocks in the sunny border at Garden #4 in Flatbush. The upper photo shows a single male, I believe, on a leaf. The lower photo shows a pair in their typical posture, ie: mating. The female has her (even longer) snout buried in the flower bud. 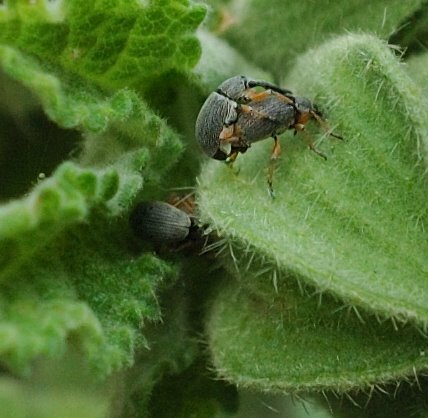 The taxonomy of Apion (Rhopalapion) longirostre, common name Hollyhock weevil or (sometimes) Black vine weevil, is confusing. I've seen it listed as being in the Family Brentidae, the straight snout weevils, the Apionidae or Apioninae, and the Curculionidae. Whatever! They are in the order Coleoptera, the beetles. The genus Apion seem to generally have long snouts. Their antenna are jointed and located halfway along the snout. A. longirostre is distinguished from other Apion species by its orange legs. Their native range of A. longirostre is in Eurasia, originally limited to southern and southeastern Europe and Asia Minor. It has since spread much further afield there. It was first detected in North America in Georgia in 1914. Within fifty years it had spread across the continent. Science & the City announced that another Brooklynite, Ben Jervey, has just published a book, "The Big Green Apple: Your Guide to Eco-Friendly Living in New York City." He's also launched a Web site, Green Apple Guide, in association with the book. Right now, right here in New York City, somebody is cultivating a garden. [And how!] Around the corner, somebody is pocketing their car keys and hopping onto a bicycle. In some nearby kitchen, locally grown, organic produce is being kept cool in a refrigerator plugged into wind power energy. Somewhere in New York City, a street tree is being cared for by a concerned local resident, while a sanitation worker on the street adjacent is dutifully keeping the recyclable paper and plastics separate. Although difficult for many to believe, all over the city of New York, acts of sustainable, low-impact living are being performed by a hearty bunch of citizens who recognize the inflexible connection between the quality of life in a place and the attitudes and lifestyle decisions made by those who live there. Reduce, reuse, recycle - in that order! Tips 2 and 5 are of particular relevance to gardening. Item 3 is also of interest. Choose plants appropriate for the site, conditions, and climate. Native plants (appropriately sited) and drought-tolerant plants will need less water than others. Plants in sunny areas, containers, or exposed to extra heat from pavement, walls and other structures, will need more water. A rooftop garden, for example, is essentially a desert; choose and plant appropriately. Increase the amount of organic material, such as compost, in the soil. Organic material provides several water-related benefits, including absorbing and retaining water, reducing runoff by allowing water to penetrate the surface of the soil, and improving the soil structure to allow roots to run more deeply and widely, increasing the ability of plants to reach the moisture they need. When gardening in containers, use non-porous containers (I don't always do this, but I'm mindful of it) and amend the soil with water-retentive materials such as compost or hydrogel. Mulch to reduce surface runoff and evaporation. Water only when needed. If the soil is moist below the surface, it doesn't need water (yet). Group plants with similar moisture requirements together, so you can water them at the same time. When extra water is needed, water in the morning (ideally) before the sun is fully up, or in late afternoon or early evening, as the sun is going down. Water at or below the mulch or surface of the soil. A sprinkler loses more water to evaporation, in the air and from leaves, than hand watering at the surface. Soaker hoses reduce evaporation even more, since they can be placed on or below the mulch or soil surface. For containers, drip irrigation systems can achieve the same result. I haven't used either of these, but my neighbor uses soaker hoses, and I hardly ever see any water runoff. The only way I know they're watering is from the sound of the water passing through their faucet! I'm hoping to invest in a soaker system, possibly next year, when I have a better idea of how the beds will be arranged. Collect rainwater for garden watering. Again, I haven't had the opportunity to try this before. Now that we have a house, it's a possibility. Apply organic growing techniques to reduce the use of fertilizers, pesticides and other chemicals in the garden. Reduce or eliminate areas devoted to lawn and turf. Grow some of our own vegetables and fruits to reduce the need to transport them long distances to supermarkets and our homes (the "Victory garden"). Select native and heirloom plants and vegetables which we can propagate from year to year instead of having to purchase new seed, plants and bulbs each year. Replace gas-powered tools with electric ones, and powered tools with hand tools. Broken pots can be used as decorations, and pot shards can be used in the bottoms of pots to control drainage. Other artifacts can be reused in the garden as containers and decorations. One of our neighbors has an old radiator spread out as a fan and used as a decoration in their front yard! Old, misshapen or imperfect brick and other building materials which can't be used for construction can be used as pavers, stepping stones, edging and so on in the garden. Propagating plants, and giving them away to others, is the ultimate reuse. Finally, in the garden, composting is the ideal recycling technique. Yard waste such as shrub trimmings and tree prunings can be chipped and shredded. Grass clippings which are not left on the lawn are prized ingredients in compost. Fall leaves, spring cleanup trimmings and summer weeds (which have not gone to seed) go into the compost heap. Kitchen scraps (excluding meat, fat and bones) can be added to the compost as well. Yesterday, I took my laptop out to the backyard for the first time. The wireless reception was excellent. It was a little awkward, but workable, sitting in an Adirondack chair with a laptop. Although the trees provide filtered shade, I still had to brighten the screen to its highest setting, reducing battery life. So I want a table where I can put the laptop, and a regular height chair to sit at and type or write, and an umbrella to provide more complete shade. I'm researching a dining table, seating for at least four, and an 8' or 9' umbrella. I have a 7' umbrella which is on its last legs: the bottom part of the part has rotted off, and one of the spurs has broken. A 7' umbrella is just not large enough to provide enough shade for four people sitting around a table. I want wood, rather than metal, for its comfort, warmth, beauty, and the natural element it adds to the garden. The table must have an umbrella hole. Ideally, the table will be foldable, and the chairs foldable or stackable, for storage. Over the years, I've used wooden planters and garden furniture made from cedar, teak, and "tropical hardwood." In my experience, teak really does last several times longer in the garden than any other wood. For example, I can squeeze about five years out of a cedar planter by first treating the wood and reinforcing it with galvanized brackets; the bottom will rot out before the brackets give way. On the other hand, I have a teak planter nearly ten years old which is nearly new. My cedar furniture gets weathered, pitted, loose and weak after just a few years. My teak furniture turns grey the first winter and then nothing else happens to it. No wood is as resistant to rot, insects, and diseases as teak. The qualms I have about teak are about whether or not, by specifying and purchasing teak as my wood of choice, I'm contributing to deforestation, habitat destruction, and so on. It's my intent to minimize the impacts of my gardening activities, and to garden sustainably however I can. Is my teak table the equivalent of a tiger-skin rug, or an elephant foot umbrella stand? Nearly every company will claim that their teak is "ecologically harvested" or some such, whatever that means. Third-party certifications, such as those from the Forest Stewardship Council and the Rainforest Alliance, hold promise for identifying sustainable sources and holding suppliers accountable. All I can conclude is: I can't know for sure. The same problems arise when purchasing any wood product: a cedar bench could come from a clearcut forest in northwest North America, for all I know. In the absence of other information, my strategy is to select the highest quality and longest-lasting products I can, and to deal with reputable companies. I hope I can reduce my gardening "footprint" by using products which will last me twenty years or more, not something I will need to replace in five years. Crate and Barrel. I like the design of their teak Trovata Round Folding Table. However, the hardware is galvanized steel, which will eventually rust and stain the wood. Any metal used outdoors other than brass must be sealed, galvanized, or allowed to oxidize or rust. For outdoor folding furniture, the best hardware is brass. Land's End. They've just recently added an "Outdoor Living" category to their catalogs and Web site. Plow & Hearth. They offer furniture made from eucalyptus, cedar, and "yellow balau." I have no experience with eucalyptus; I expect it's comparable to cedar. Their Lakeside series is made from eucalyptus in an attractive, Mission style. I've never heard of "yellow balau" and assume it's in the "tropical hardwood" category. Pottery Barn. They've recently added outdoor furniture to their offerings. Their Jayden series is teak. They have the least expensive umbrellas. Smith & Hawken. The original popularizer of teak garden furniture and planters. They've made an effort to select reputable sources. At full price, among the most expensive. I wait for sales and discounts. Wood Classics. My favorite company for teak furniture. They're employee-owned and based in upstate New York. What I especially like, is that all their furniture is offered in kit form at deep discounts over the assembled, and even flat pack, pricing. This makes their teak furniture competitive with other suppliers, and gives me the satisfaction of building the furniture myself. First parrot sighting of the season! I just heard, and then saw, a pair of the Brooklyn Parrots. This is my first sighting this season. They were flying down the adjacent road, just below rooftop level. I saw them as they passed between our two back neighbors' houses. They're easily identified. They are large (about the size of a blue jay), bright green, loud birds. Their flight is also distinctive: straight, strong, and fast. Myiopsitta monachus, Monk Parakeets, have established numerous colonies in Brooklyn. They are Brooklyn's most charismatic potentially invasive species. They are also now established in over a dozen other states. Monk Parakeets are the only parrot species which build their own nests, rather than nest in existing cavities. They create large, communal nests of twigs and other materials. This is one of the characteristics which enables them to adapt to our winters. That, and they like to build their nests around the transformers of power distribution towers. I'm writing this from my tree fort. Actually, it's the rear porch on the second floor of our house, roofed and screened (mostly). Seated at the table here, my line of sight is about 17 or 18 feet from ground level. It's dusk. Most of the birds have settled in for the night. I hear, but can't see, a cardinal calling out from high in a neighbor's tree. 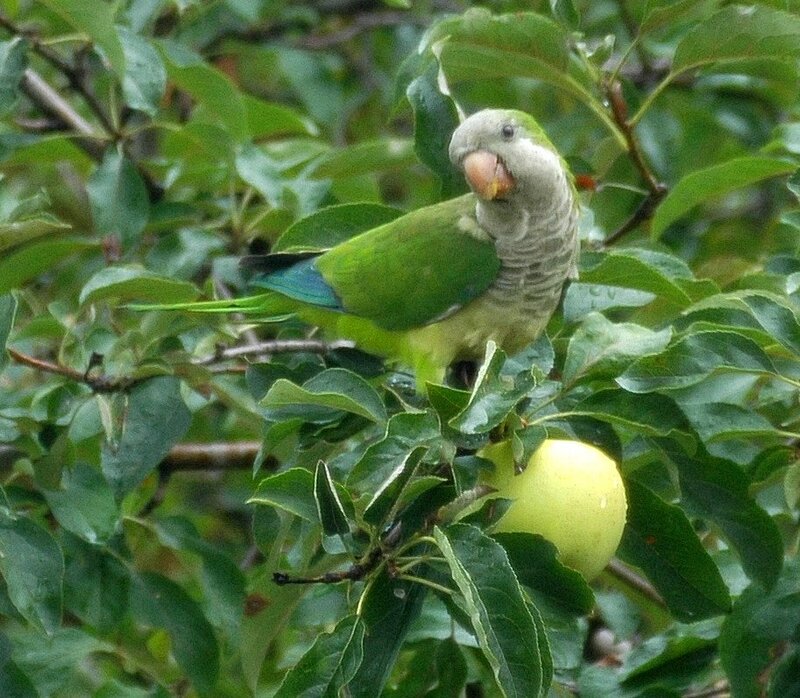 To my left is our next door neighbors' apple tree; its apples are showing color now, so maybe we'll have parrots at the end of the summer again like last year. In front of me, in our backyard, are two Norway Maples towering overhead and our flowering cherry tree barely reaching my eye-level. Behind us, our back neighbor has another flowering cherry. On the other side of us, to my right, our other next door neighbor has in their backyard a cedar, a spruce, a dogwood, and something else I don't know. Behind them is a birch. Beyond, more distant and all around, are more maples, oaks - everything. This neighborhood is all about its trees. Our lot is 50' wide at the street and 100' deep, like most of the lots in this area. For New York City, that's huge; most townhouses are 20' wide or less. The houses are fully detached, wood-frame homes built at the turn of the last century, mostly late Victorian in style as ours is. No two of the houses are exactly alike. From up here on the back porch, you can see nearly every style of roof and dormer: shed, gable, hipped, gambrel, and eyebrow. This leaves lots of room for trees, and gardens. Here, at my fourth garden in New York City, for the first time I can have multiple gardens: front, back, and two sides. I've watched and weeded and planted and watered them over the year since we moved in. My ideas for them, for what they will all become, have shifted a little over the past year. The front yard faces West. It's shaded by street trees for much of the day during the summer, which limits the varieties I can grow there. There is a sunlight gradient from the south side of the front yard, which is open and sunnier, to the north side, which is more shaded. There is also a small lawn. When we first moved, I thought I would eliminate it. But when I walk along the sidewalk on our block, I see the arbor of trees along the street on one side, and the sweep of lawn uniting the properties on the other. It is a parklike setting, and when this view is interrupted by hedges, walls or fences, I miss it. To preserve this, I can live with a little bit of lawn. The front yard will be the heirloom/antique garden. All the plants there will be species and varieties which were available over 100 years ago, 1905 or earlier. Our house was built in 1900, so this is the "Neo-Victorian" garden referenced in this blog. No elaborate bedding plant schemes or anything like that. There will be heirloom bulbs, perennials, annuals, a shrub or two, and at least one old rose. Victorian gardeners were eclectic, fascinated with the new and bizarre, while embracing the old-fashioned and comforting. Which describes me pretty well. On the south side of the house is the driveway. During the summer, the sun is high enough to clear even the three stories of our next door neighbor's house. The bed along this side of the house gets full sun. It runs nearly the depth of the house, for 35 feet or more. Its width varies: it's about 8' at the deepest and tapers to a point at the rear corner of the house. This will be the cutting garden, the rough garden, the wild garden ... the garden for anything I want to grow that doesn't fit anywhere else. This will be a mixed border. Variations in height, color and texture will make the beds seem longer, and deeper, than they actually are. There will be a place here for at least one other old rose and some other shrubs. There's enough room here for them to grow large enough to partially shade the first floor of the house and keep it cooler in summer, while allowing sun in the winter to warm it. These will also visually anchor the house to the property, connecting it to the land and making it seem smaller than it is. The backyard will be a sanctuary garden, for people and wildlife. It will be separated from the side yard and driveway by a fence and gate. Visitors will pass through a deep trellis, providing a transition to mark the entry into the sanctuary. Vines on the trellis will shield the backyard further, providing a feeling of enclosure and reinforcing the sanctuary. There will be seating back here, and a porch swing suspended from another trellis. The backyard will be all native plants (save for the Norway Maples, about which I can do little for now). I've had bird feeders up, but these attract junk birds - European finches, starlings, even the occasional pigeon - as well as native species. So I'll be planting the native shrubs I've collected over the years. The tallest will grow up to 15' in time, providing an understory. These will provide berries as well as shelter, and possibly nesting sites. At ground level there will be ferns and wildflowers. There will be a mix of things growing from the ground up into the lowest reaches of the canopy provided by the trees. The north side of the property is narrow, maybe 6' wide. Native plants, especially ferns, will continue onto this side of the house. There will also be other shade plants: hostas, astilbes, and so on. A narrow path will lead to another gate and trellis to demark the transition between the backyard sanctuary and the front, public side of the property. On the front side of the gate will be more shade plants, merging with our next door neighbor's mixed bed along their driveway, blurring the line between the two properties. The path continues to the front of the house, to the front steps, and back to the heirloom garden. While I could walk around the property in a minute or two, all these transitions, shielded views and sheltered places, changes in designs and textures, and the sheer number of different species of plants all have a larger purpose. I want visitors, and me, to slow down, to view, to feel, to smell, to listen to the gardens. The gardens will invite us to stretch out time and space, to connect, however briefly, with other rhythms and beats. The gardens will allow us to synch with the pace of the minute, the day, the seasons, the years. It will take years to accomplish all this. But I'm hoping to be here a long while. I hope that things will be in good enough shape in two years that I can add my gardens to the Victorian Flatbush House and Garden Tour. Visitors to this blog will be able to watch my progress over the next two years. And if I get on the tour, you'll be the first to know. A web log from another Brooklynite, Rob J: "Red-tailed Hawks and other wildlife observations from around Brooklyn and NYC." Beautiful photographs of nesting hawks and other birds all around New York City, and photo-journals of field trips to upstate New York and other areas. An avid, nay fanatical, birder. Rob also authors Prospect Park Advocate on blogspot. On NYC Bloggers, he locates himself at my old subway stop in Park Slope, 7th Avenue on the F Train, which has the most blogs of any subway stop in Brooklyn. I'm a space baby. During the 60s, I watched rocket launches from my bedroom window. Aside from my fascination with the technology, satellite imagery and data has transformed our recognition and understanding of earth systems. Think "ozone hole" for just one example. I'm encouraged by news such as this. There is a strident minority in this country who would replace science and inquiry with fundamentalism and eisegesis. May they be left behind. 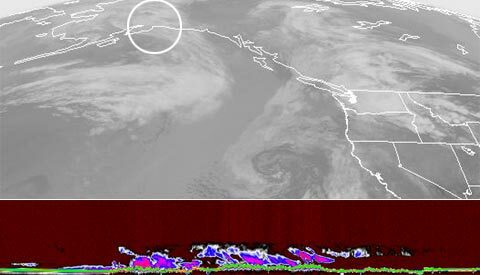 CloudSat and CALIPSO will collect information about the vertical structure of clouds and aerosols unavailable from other Earth observing satellites. Their data will improve our models and provide a better understanding of the human impact on the atmosphere. Policy makers and business leaders will make more informed long-term environmental decisions about public health, the economy and better day-to-day weather predictions as a result of these missions. The Church Avenue Merchants' Block Association, CAMBA, is holding their annual benefit sale of Shona sculpture - stone sculpture from the Shona artists in the Republic of Zimbabwe - this week. The CAMBA Gallery is located at 19 Winthrop Street, just east of Flatbush Avenue, one block north of Parkside Avenue. The closest subway stop is the Q Train Parkside Avenue station. The phone number is (718) 284-9064. Strong fragrance. I want the fragrance available for passersby and open windows in the summertime. Good rebloom. Since the front garden is not large, it needs to put on a good show for a long time. Old/heirloom/antique. The variety was introduced before 1905, ideally in the late 1800s. Our house was built in 1900. Non-invasive. Roses which are clearly invasive in the New York City area are R. multifora, Multiflora Rose and R. rugosa, Beach Rose. Disease resistance for mildew, black spot, and so on. Shrub form, non-climbing. Up to 6' high and wide is okay. Long season interest. This is provided by good foliage, especially persistent or semi-evergreen leaves, rose hips, and interesting branching structure. I've been able to find a surprisingly large number of varieties, primarily by taking advantage of the advanced search capabilities offered by the Web sites of Rogue Valley Roses (RVR) and Vintage Gardens (VG). Both of these offer searching by fragrance, rebloom, and year of introduction. I tried using HelpMeFind/Roses, but it doesn't offer any search by fragrance, and attempts to include year of introduction in the search returned nothing. Of the list below, varieties which most interest me right now are marked with *. I don't think I have enough room to grow them all, since I'm not interested in growing a rose garden. I might try a few, keep the ones perform best in my gardens, and give away or donate the others. Varieties which are not suitable for my needs are marked with -. Aimée Vibert (RVR, VG). Introduced 1828. Flower color: white/near white. Foliage: Dark green, semi-evergreen. Habit: Spreading. Height: 4'. Disease resistant. *Ardoisée de Lyon (RVR, VG), a color sport of Baronne Prévost. Introduced 1858. Flower color: Deep pink/purple, fading to lavender and mauve. Habit: Upright. Height: 6'. Disease resistant. Good for hips. Good for cutting. -Baltimore Belle (RVR, VG). Introduced 1843. Flower color: Blush pink (VG), White, near white (RVR). Habit: Rambler. Height: 10-15'. RVR doesn't list this as reblooming, while VG notes a long, moderate rebloom. *Baronne Prévost (RVR, VG). Introduced 1842. Flower color: Rose/Clear/Deep Pink. Habit: Upright. Height: 6'. Disease resistant. Good for cutting. -Blanc Double de Coubert (RVR, VG), classified as a Rugosa. Introduced 1892. Flower color: White. Sets few hips. Blush Noisette (RVR, VG). Introduced 1814/1817. Flower color: Blush/Light pink. Habit: Shrub, upright. Height: 6-8'. Disease resistant. Cecile Brunner, Everblooming Spray form (RVR). Introduced 1881. *Clotilde Soupert (RVR, VG). Introduced 1890. Flower color: White with pink centers. Habit: Upright. Height: 3'. Both RVR and VG note that this variety "balls" for them, whatever that means, especially in the cool, wet weather of spring. It seems to mean that the buds never fully open. -Deuil de Dr. Reynaud (RVR, VG). Introduced 1862. Flower color: Cerise, deep pink. Habit: Shrub, or climber. Height: 10-15'. Eugene de Beauharnais (RVR). Introduced 1838. Général Jacqueminot (General Jack) (RVR, VG). Introduced 1846/1853. Flower color: Dark red. Habit: Shrub or Climber. Height: 8-10'. Good for cutting. Mme. Bérard (RVR, VG). Introduced 1870. Flower color: Apricot, Peach. Habit: Shrub. Height: 6-8'. Mme. Creux (VG), likely Kaiserin Freidrich. Introduced 1890. Flower color: Apricot-Buff. Habit: Upright? Height: 4-5'? -Mme. Ernest Calvat (RVR, VG), possibly sport of Mme. Isaac Pereire. Introduced 1888. Flower color: Light pink, lavender, cerise. Habit: Upright. Height: 10-15'. Shade Tolerant. Good for cutting. *Mme. Isaac Pereire (RVR, VG). Introduced 1881. Flower color: Pink, amaranth, magenta, purple. Habit: Arching. Height: 8-10'. Good for hips. Good for cutting. Mme. Lambard (RVR, VG). Introduced 1878. Flower color: Variable, pink, apricot, coppery. Habit: Spreading. Height: 6'. Good for cutting. *Marie Pavie (RVR). Introduced 1888. Flower color: White. Habit: Upright. Height: 3'. Very disease resistant. Good for cutting. Narrow Water (RVR, VG), sport of Nastarana. Introduced 1883. Flower color: Blush/Light pink. Habit: Shrub, upright? Height: 6-8'. Nastarana (RVR, VG). Introduced 1879. Flower color: White. Habit: Shrub. Height: 6-8'. Good for cutting. *Pierre Notting (RVR, VG). (Note: This is completely different from Souvenir de Pierre Notting.) Introduced 1863. Flower color: Dark red (VG), Mauve (RVR). Habit: Shrub. Height: 6-8'. Good for cutting. Pink Soupert (VG). Introduced 1896. VG describes this as "Almost a ringer for Clothilde Soupert, and every bit as fragrant, but with somewhat smaller flowers a bit less double, foliage narrower, more rugose." *Reine des Violettes (RVR, VG). Introduced 1860. Flower color: Violet/lilac/mauve. Habit: Shrurb. Height: 6-8'. Disease resistant. Today I mowed the lawn. It's incredible that I have a lawn to mow. I suppose the novelty will wear off. In the heat of summer, the delight of raking, and walking my push-reel mower back and forth across the width of the house, and gathering up the precious green clippings for the compost ... In the heat of summer, all this will be more of a chore, will require me to get up earlier in the morning, before it gets into the 80s, and 90s. But for now, when it's still possible to catch a cool day without rain, it's still a pleasure. And I got to use my new toy: The cordless weed whacker. The grass in the median strip between the sidewalk and the street was heavy and wet from lack of mowing and the rain of the past few days. It's too choppy and trashy to use the push-reel. The heavy grass drained the battery of the whacker, but I got it done. I just didn't get to finish edging with it before the juice ran out. Another day for that. Then there was my elderly neighbor down the block who walks the dogs who "don't like men." I think they would like me, if we were given the chance. I walked her through the gardens and showed her what was blooming, answering her numerous questions about what things were. I showed her what's coming up, what weeds there are I need to deal with, what's going to bloom later in the year. I gave her some Hosta and bachelor's button from my garden for her to plant in her yard. I'll give her some Iris when it finishes blooming. I thought that, when they saw me sitting on my front steps, the might move to the sidewalk, and I would invite them to continue running across our lawn as well. I needn't have bothered. When they got to our yard, they continued across our lawn without visible pause or hesitation. The older barely regarded me. And on to the next lawn. After they passed, I came to tears. And so I weed, and mow, and rake, with gratitude. The StoryCorps booth in the PATH station at the World Trade Center, taken when my partner and I recorded our remembrance of our friend David Joseph Wilcox on the 10th anniversary of his death from AIDS. 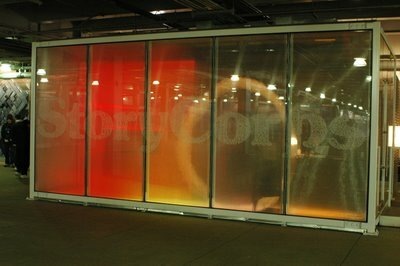 The Brooklyn Historical Society and StoryCorps are dedicating the week of Sunday, June 18 through Saturday, June 24 at the StoryCorp's Lower Manhattan StoryBooth to the stories of those who live and work in Brooklyn. To make a reservation, call StoryCorps at (646) 723-7027, Monday through Friday, 9:30 AM to 5:30 PM. Online reservations will not be accepted for this event. 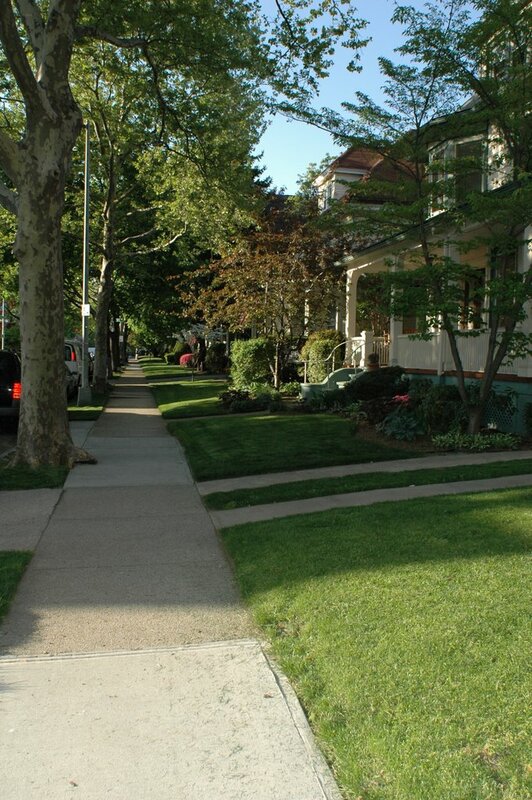 Flatbush Development Corporation's annual Victorian Flatbush House and Garden Tour is scheduled this year for Sunday, June 11, from 11am to 6pm. The Victorian Flatbush section of Brooklyn ranges from Prospect Park on the north, to Brooklyn College in the south, and from Flatbush Avenue on the east, to Coney Island Avenue on the west. Most of the properties are fully "detached" houses built around the turn of the last century. There are a dozen different identified neighborhoods in this area. Real estate listings typically refer to this entire area inaccurately as "Ditmas Park", which is just one of these neighborhoods. The photo above was taken May 4th, 2006. It shows the view looking up the block from the sidewalk in front of our house. In 2005, my partner and I bought our first home in another of these neighborhoods: Beverly Square West. Our house was built in 1900. 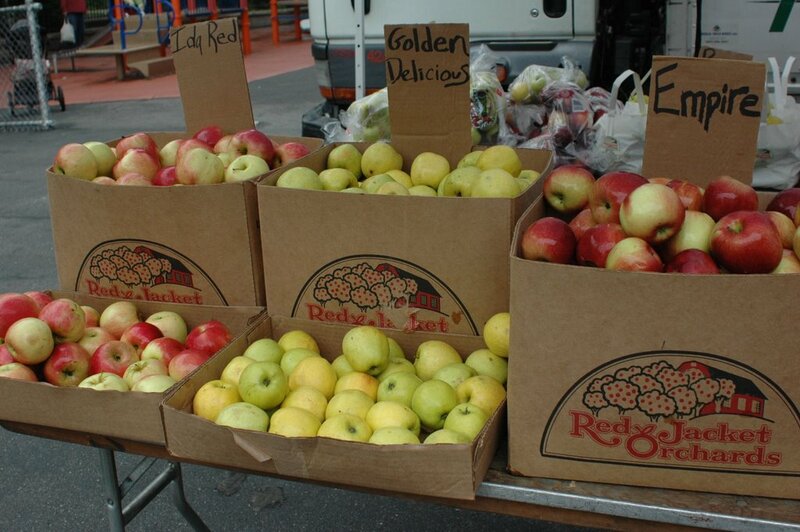 Some of the apple varieties available from Red Jacket Orchards at the Courtelyou Greenmarket on opening day. Greenmarket has organized and managed open-air farmers markets in NYC since 1976. By providing regional small family farmers with opportunities to sell their fruits, vegetables and other farm products to New Yorkers, Greenmarket supports farmers and preserves farmland for the future. Based on our experience last year, the number of vendors will ramp up through the month of June. There's about a dozen during the summer, selling all kinds of fresh fruits and vegetables, plus meat, dairy, baked goods and some handcrafts. The next Brooklyn Wild Parrot Safari is Saturday, June 3, 2006.
at Brooklyn College's Hillel Gate, on Campus Road at Hillel Place, close to the last stop on the 2 train (Flatbush Avenue/Nostrand Avenue). The photo above was taken September 29, 2005. It shows a parrot checking me out as s/he's about to get into a fruit from our next-door neighbor's apple tree. Their apple tree bloomed gloriously last Spring, just after we bought our house. More blooms = more bees = more apples = more parrots. This Spring the bloom was scant, so we expect fewer apples, and fewer parrots, this year than last. Web Resource: Vintage Gardens, "Antique & Extraordinary Roses"
I'm trying to select an "antique" rose or two for the heirloom garden, one which was available in 1905 or earlier. (Our house was built in 1900.) I don't want to have to learn how roses are classified: Floribunda, Musk, Bourbon, and so on. I want a rose which will perform well in a mixed border: long-/repeat-blooming, fragrant, disease-free. Many of the rose growers I've found online assume that the visitor is a rose "geek." The only way to look at their offerings is to browse through a hierarchical listing of what's available. They require that you already know the rose you're looking for and how it's classified. Vintage Gardens provides the best online search tool I've found. Our rose collection has grown to over 3500 varieties, including every rose class from the very oldest to the most modern. It is the largest collection of roses offered by any nursery in the world today. We value each variety and look on this as a preservation collection that provides a valuable resource to gardeners and helps to preserve our heritage of roses. We go to the greatest lengths to maintain correct identifications on our roses. We research and compare with collections worldwide to ensure that our information is as accurate as it can be. In our catalogue we identify the source from which our mother plant came, to assist others who are seeking a specific rose. Below is a table listing partial results from a search for roses introduced in the 1800s with intense scent and rapid rebloom. Clotilde Soupert 1890 White, "pale blush with a lilac-pink heart" The photo of this on VG's Web site is gorgeous. They describe it as "Very round, very double flowers of Victorian perfection ..." Just what I need for the heirloom garden! Deuil de Dr. Reynaud 1862 Cerise "... appears to be identical with the Bourbon rose labeled Philémon Cochet (Cochet-Cochet, 1895) at the Roserie de l'Hay." Devoniensis, Climbing AKA "Magnolia Rose", "Tradd St. Yellow" 1858 Cream, "... primrose yellow, magnolia white or ivory, depending on the weather." Mme. Bérard 1870 Peach Pink, "... honey colored flowers which take on golden-apricot shades in the Spring and Fall ..."
Mme. Creux (Kaiserin Freidrich) 1893 Apricot-Buff "As we have observed this over the past few years we grow convinced that this rose is identical with Kaiserin Freiderich, a modest growing Tea-Noisette. We suspect that the latter is more likely the correct identity." Mme. Isaac Pereire 1881 Purple, "... intensely colored claret pink, amaranth and magenta" ... Another which looks amazing on VG's Web site. "... perhaps the most extraordinary of the Bourbons. Large, intensely colored claret pink, amaranth and magenta flowers of surpassing fragrance ..."
Mme. Lambard 1878 Peach Pink, mutable, "... shades of pink, buff, apricot, rose, blush and coppery yellow"
Pierre Notting 1863 Dark Red This one's also on my short list for the heirloom garden. "Very full, large velvety red flowers which at their best have no peer among the Hybrid Perpetuals." Understanding the urban landscape is critical in our rapidly urbanizing world. Findings of BBG's Metropolitan Flora Project serve as vital references for those involved in environmental efforts, from preserving rare plants, to planning parks and greenways, to repairing degraded habitats, to designing home gardens in which native plant communities are preserved or restored.